Lucid dreams about shopping can connect you with your deepest desires. Lucid dreaming, sometimes called conscious dreaming, is a fascinating state that can give you the ability to control your dreams to an extent. The symbol of shopping has interesting meanings and associations that may make lucid shopping dreams something fascinating to explore. Conscious dreaming is a state in which you are aware that you are dreaming, and this state opens a world of possibilities in dreams. While lucid dreaming may or may not be the key to controlling your dreams, it does make the experience feel mystical. Some people go as far as to try to make a lucid dream occur by using products like lucid dream masks. The desire to become aware of the images you experience during sleep can be great, and the notion of dream control can be fascinating. If you find yourself having recurring lucid shopping dreams, you may want to explore shopping as a dream symbol. Symbolism is an important part of dream interpretation, and images related to shopping are rich with possibilities. Shopping is an activity that many people enjoy, but it can be an indicator that you are searching for answers. If your mind is telling you that you are dreaming while you experience images of shopping, it can be an indicator that the event is significant in your subconscious. 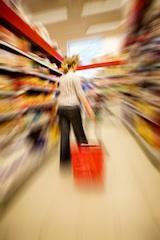 Shopping in dream interpretation represents your needs, desires and opportunities. If your lucid dream about shopping involves the inability to find what you are looking for, it may be an indicator of a problem that needs a solution. The notion of dreaming about desires and needs is nothing new, but the image of shopping can communicate the drive to fulfill them. It is the search that you may be exploring in this type of dream. Then again, you may be sorting through different avenues that you could take in your waking life. The image of yourself browsing items that are seemingly out of reach can be an indicator that you feel denied of things that you desire. You may not feel satisfied in your current path, and feeling of inadequacy may be present. Window shopping in a lucid dream conjures feelings of detachment and isolation. You may be subconsciously trying to figure out what is missing in your life. Dreaming about a mall has some obvious associations, but it also has some surprisingly deep meanings as well. Obvious associations include the desire to keep up with the latest trends in fashion and technology. Malls can also indicate materialistic tendencies, which makes sense. On a complex level, a mall can represent a desire to impress others, and it can be an indicator that you are searching for your identity. With this in mind, it can be helpful to ask what you are shopping for. The type of store you visit during the lucid dream can change the meaning of the dream. For example, dreams about shopping in a thrift store may represent lessons that you can still learn from past experiences. The thrift store can also represent skills and talents that you have forgotten about, but may come in handy. Dreaming about a hardware store has different meaning; you may need to change your attitude about a situation or you may need to improve yourself. Shopping involves many different elements that can mean different things. Each dreamer is unique, and your personal associations with buying things may be quite different from another person's associations. For example, you may love to shop, but another person may find the activity stressful and tiresome. These personal factors can play into dream interpretation. Dreaming is a mysterious sleep-related phenomenon that researchers, psychologist and dream enthusiasts continue to explore. Many theories exist, and some tools for analyzing dreams can provide guidance. Lucid shopping dreams may offer insight into the inner workings of your mind, but interpreting the events that unfold in your dream experience is a highly personal task. Only you can unravel the mystery of your images and symbols, if it is possible at all. If the mysteries of lucid dreams seem to be interfering with your ability to get a refreshing night's sleep, you may want to consider discussing the problem with a doctor. Lucid dreams are not sleep disorders, but there may be underlying issues present, especially if you experience excessive daytime sleepiness.